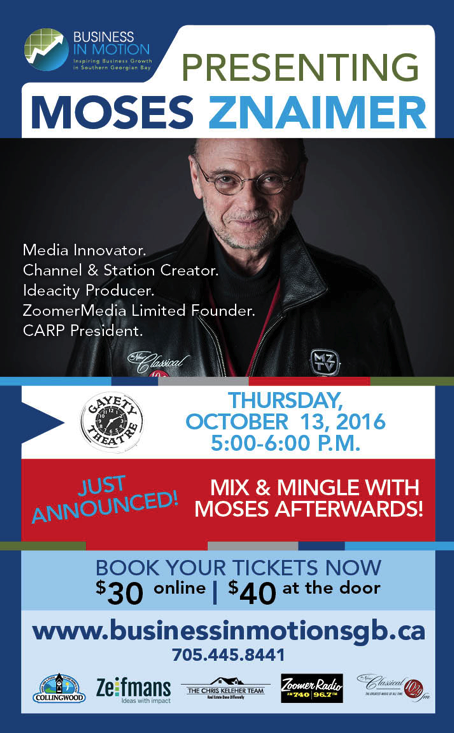 Moses Znaimer, the internationally renowned Canadian broadcaster and media pioneer, will be speaking at the Historic Gayety Theatre in Collingwood on October 13th starting at 5pm. This will be the first time Moses will speak in South Georgian Bay about his role in shaping Canada’s media landscape, championing the needs and interests of Canada’s 15.3 million people aged 45plus, and most recently bringing classical music to the region. Following the event, guests will be invited to Mix & Mingle with Moses next door to the Historic Gayety Theatre featuring appetizers from Sushi Hon. In the 1970s, long before Facebook, Twitter or YouTube, Moses anticipated the popularity of user-generated content. His groundbreaking television concepts, notably Speaker’s Corner, Videography and the Studioless Streetfront Television Operating System were at the core of over 20 independent stations and channels he co-founded, including CityTV, Bravo!, and CablePulse24; not to mention MuchMusic and MusiquePlus, which served to define a generation of Canadian youth in both official languages. Today, Moses is President of CARP, the country’s largest non-profit, non­partisan member-based advocacy association committed to enhancing the quality of life for ageing Canadians. Moses is also the Founder of ZoomerMedia Limited, Canada’s only diversified media company uniquely devoted to creating content, services, and experiences for the 45plus on all platforms: National and Regional Television, Regional Radio, Digital Properties, Trade Shows, and the flagship ZOOMER magazine. In 2014, Moses expanded ZoomerMedia’s regional radio reach to South Georgian Bay with the launch of The New Classical 102.9 FM. Watch a personal video message from Moses below and book your tickets now at businessinmotionsgb.ca. This event is part of the Business in Motion Speaker Series. Launched in 2014, Business in Motion has hosted such notable speakers as Canadian economist, demographer and best-selling author, Dr. David Foote, as well as leading health & wellbeing speakers Dr. Elaine Chin and Dr. Greg Wells.